Phytophthora root rot is the most common soil-borne disease causing plant death in native cutflower production. 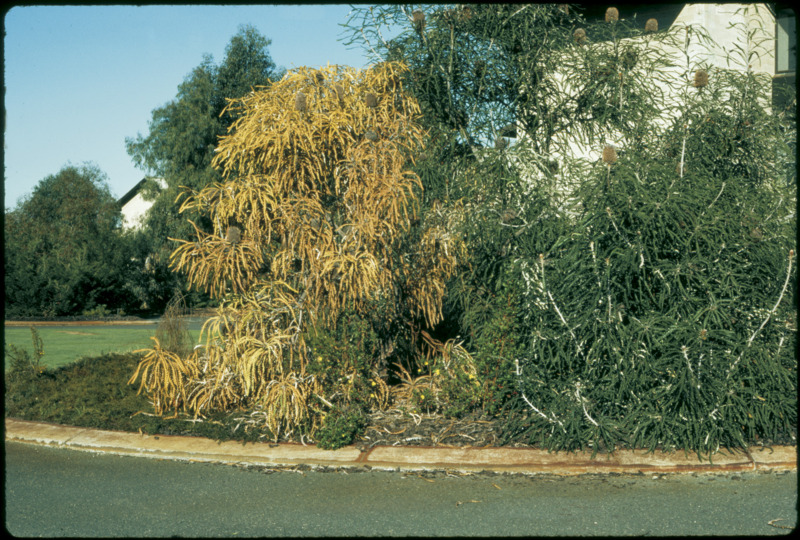 The fungus Phytophthora cinnamomi, cause of jarrah dieback, is the first pathogen that comes to mind, however other species can infect native plants as well as exotic cutflower crops such as roses, lillies, carnations, proteas and gerberas. It is difficult to eradicate the disease once present. Prevention is a better option. This page deals only with control methods for soil-borne Phytophthora species and is adapted from Bulletin 4682. Phytophthora cinnamomi has the one of the widest host ranges of all Phytophthora species, particularly among native Australian plants. P. nicotianae also has a wide host range, infecting many exotic, as well as Australian native, flower crops. A number of other species of Phytophthora can infect native plants. Some are important soil-borne pathogens infecting the root collar and main roots. Other species infect the aerial parts of the plant such as leaves, flowers and fruit. Although not proven, it is widely accepted that Phytophthora cinnamomi was introduced to Australia. In general, measures that control P. cinnamomi will control other soil-borne species of Phytophthora. Additional methods of control are required for those Phytophthora species with wind-dispersed sporangia, such as P. ramorum and P. infestans (neither of which currently occurs in Western Australia). Those species may be spread aerially in irrigation splash and wind-driven rain, and their sporangia are more tolerant to drought. Phytophthora spp. are very variable (see Figures 1a-c), and consequently difficult to identify. Recent use of DNA techniques has found many previously unrecognised species, which makes definitive identification both time-consuming and expensive. In many cases the additional cost is not warranted. P. cinnamomi occurs in native plant communities from Eneabba to Esperance. Plant communities within areas with rainfall above 400mm are most affected. Over 40% (2300) of native plant species in the South West are known to be susceptible to P. cinnamomi and over half of the state’s rare or endangered plant species are deemed highly susceptible. Surveys of natural bushland have also found other species. P. citricola has a wide distribution from Eneabba to Esperance but does not seem to cause major damage. One species, believed at the time to be P. megasperma, has been found north of Eneabba and associated with sudden deaths after summer rainfall. Both P. cryptogea and P. drechsleri have been found but are not common. P. cryptogea tends to have a distribution south of Perth whereas P. drechsleri is weighted towards the northern sandplain. P. nicotianae is rare in the field and generally found close to suburbia, suggesting it is associated with human activity – perhaps spread from domestic gardens. P. nicotianae is the major soil-borne pathogen in nursery plants and a major cause of loss of exotic flower crops. P. palmivora is found as a root-rotting organism as well as a rapid foliage and fruit rot under wet conditions on the east coast subtropics to tropics. A study of Western Australian nurseries in 1988 found eight species. P. drechsleri was most common, followed by P. nicotianae. On the east coast this is reversed. A study of native cutflower properties in 2000 showed about half of surveyed properties were infested with Phytophthora. P. cinnamomi was the most common pathogen, but P. cryptogea, P. cactorum, P. citricola and P nicotianae were also found. Phytophthora ramorum or sudden oak death has killed many oak trees in California since 1995. It is not known in Australia. Apart from oak (Quercus) species, P. ramorum infects camellia, rhododendron and species of Acer (maples), Magnolia, Michelia, Abies (fir), Viburnum, Taxus (yew), Fraxinus (ash), Pieris, Arbutus unedo and others. Phytophthora species persist mainly in the soil as dormant resting spores (oospores or chlamydospores) or in infected plant tissue as vegetative mycelium. When the soil is moist or wet, reproductive organs (sporangia) are produced. These release swarms of zoospores which are the main infective structures. Zoospores have tail-like structures called flagella that enable them to swim short distances through water-filled soil pores. They may be chemically attracted to susceptible plant roots or swim to the soil surface where they can be transported in run-off. Some species of Phytophthora infect above-ground plant parts such as leaves. For example, P. infestans infects potatoes, tomatoes and some ornamentals and P. palmivora has a wide host range. Phytophthora species require moist soil conditions and warm temperatures to be active. Symptoms develop more rapidly when the plant is stressed by periodic droughting, fluctuating watertables, overfertilising, waterlogged conditions and higher temperatures associated with wet conditions. Infection does not necessarily occur when zoospores reach susceptible plant tissue. Healthy plants are often able to resist infection. Plant stress, especially waterlogging, promotes infection. Some plants are tolerant of Phytophthora, others are highly susceptible and some are tolerant under some conditions and susceptible under others. Murdoch University’s Centre for Phytophthora Science and Management lists susceptible and resistant native plant species (www.cpsm.murdoch.edu.au). In addition, there have been other studies on specific genera of interest to native cutflower growers. Many of the common species in horticulture are susceptible. These include Banksia hookeriana, B. coccinea (see Figure 2), B. prionotes, B. occidentalis, B. baxteri, B. speciosa, B. grandis, B. menziesii and B. victoriae. All prostrate species show low susceptibility. Eight eastern Australian species showing tolerance under some conditions to some species are B. aemula, B. ericifolia var. ericifolia, B. integrifolia var. integrifolia, B. oblongifolia, B. paludosa, B. robur, B. serrata and B. spinulosa var. collina. Several studies have been done on a range of species in these genera. Tolerance varies depending on factors including the particular selection of the species and the Phytophthora species present. Figure 3 shows a leucadendron dead following infection with P. cinnamomi. Early symptoms include wilting, often with the onset of warm weather which promotes disease. Plants are unable to adequately absorb water from the soil due to damage of the roots and water-conducting vessels. The foliage may bleach or yellow, then desiccate. Inspection will show discolouration of young feeder roots and occasionally larger roots in older infections. If bark is cut from the collar region there may be discolouration of the tissue below. Often symptoms are initially present on one branch or side of the plant. Death may occur in a few days or over several weeks or months or even years. Symptoms may also fluctuate in severity depending on the weather and soil conditions and the periodic use of fungicides. For species of Phytophthora which also infect leaves such as P. infestans, leaf spots may be present. Those species are able to be spread by air (usually only where dislodged by water droplets during wet weather, over-irrigation etc) as well as water. In gerbera, P. cryptogea and P. nicotianae cause wilting and collapse of infected plants. Leaves turn brown and the crown and roots rot.